A day after Arkansas State released running back Michael Dyer for a "violation of team rules," details are starting to emerge about what prompted Dyer's dismissal. According to several published reports, Dyer's troubles stemmed from a traffic stop on March 10. He was stopped for going 96 in a 70 mph zone and was fined $17 and given five days of community service. But it's what the Jonesboro Sun found when it dug deeper that contributed to Dyer's downfall (the Sun story is behind a paywall so I'm linking another source). According to the paper, the state trooper who made the stop also found a handgun and a substance believed to be marijuana in the car but omitted both finds and no charges were ever filed. The Sun obtained the video of the stop, which includes a conversation between Little Rock Christian graduate Dyer and Trooper Royce Denney, who either knew or came to know Dyer was a football player. The videotape shows Denney asking Dyer if the gun is registered. "Carrying a pistol around? Uncool ... You've got a career ahead of you but you're being a total dumbass right now," the newspaper quotes from the video. Denney says he could report the incident to Coach Gus Malzahn, but adds: "What's the best way to make you think? You're a grown man and I'm not trying to treat you like a kid." He also reportedly tells Dyer he doesn't want to tell Malzahn about the incident "because of the NCAA crap." According to the newspaper account of the video, Dyer responds: "I'm done with this. This is my second chance over here." He urged Denney to take the gun. Eventually, Denney turns the camera off. The state trooper is currently under investigation for his actions and comments during the stop. This isn't the first time Dyer has been involved in a gun-related incident. 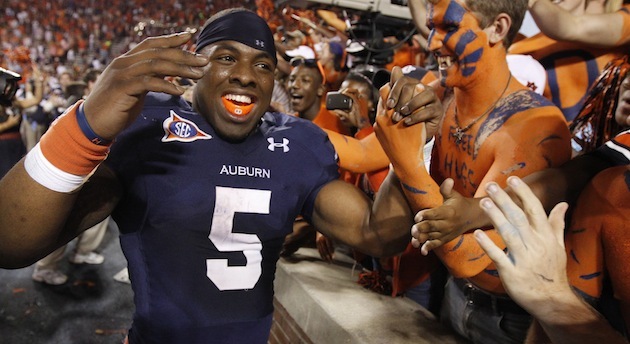 Dyer was suspended at Auburn after a gun he owned was used in an armed robbery by teammates. Dyer was not involved in the incident but testified about how the gun ended up being used in the crime. That trial occurred in April, a little more than a month after Dyer's traffic stop. At the time, Arkansas State coach Gus Malzahn said he was aware of Dyer's role in the robbery and said he was confident he had learned from his mistake. "I am fully aware of Mike's circumstances," Malzahn said in a statement released by the school. "He knows very well the high standard we have of all our players here at Arkansas State, and I'm confident that he will meet those expectations." From Malzahn's statement, it appears as though he was not aware of Dyer's covered-up transgression. If so, you can't blame Malzahn for letting Dyer go. He gave him a second chance after Auburn, trusted him, vouched for him, put faith in him and was lied to and let down. Malzahn appeared in the Arkansas Sports Hall of Fame Celebrity Golf Classic on Monday, but refused to answer any questions about Dyer.